Now for a detailed description of the climb. It falls into two natural stages, ground to roof and roof to pinnacle. Each stage is severe. Ground to roof without the lightning conductor falls into the select aristocracy of climbs, the very severe type. All the same, it is quite feasible. Tbe first thing, if you are not a Kingsman, is to climb into college. This is easy. The writer has used nine different ways, without using the simplest method of all, that of punting down from Silver Street. About half a dozen other ways are equally easy, and the roof-climbing connoisseur will be able, if he has nothing better to do, to count up to forty or fifty possible ways. But the reader is advised not to follow the lead of one drunken Kingsman, who in full evening dress entered via the coal-hole. As his bed-maker said to him the next morning, "You didn't ought to do it". There is no night porter wandering about in King's. The authorities pay you the compliment, ugly gate-crasher, of treating you as a grown-up. And since we are not grown-up you and I, we will perform our midnight frolics as the inmates burn the midnight oil. Give them their due. It is past one o'clock, and a number of lights are still burning, sign that bulging brains are cramming themselves to bursting point. Kingsmen work hard, and as a result the authorities trust them more than the undergraduates of any other college. And to be serious for a moment, there is more friendship and understanding between dons and undergraduates in this college than in any other. Now concentrate. We are in college, padding over grass by the side of the gravel paths to reach the chapel. If seen by anyone, draw your gown round your chin, mutter Latin and look ghoulish, furtive, Rabelaisian or what you will. The passer-by will then take no notice. "Though there's doorway behind thee and window before, Go straight at the wall." As the walls rise up above you, dark and forbidding, your heart flings itself against the four walls of its prison, as though sensing a pall in the blackness of the shadows above. We reach the chapel without incident. If it is before midnight, the lamp-post opposite the main door will cause us to walk warily. After midnight, all is quiet and serenity. We may pass a don or a couple of undergraduates taking a breath of fresh air before turning in to bed, but that is all. The four corner turrets each have a chimney, but one is outstandingly the best both for climbing and seclusion. 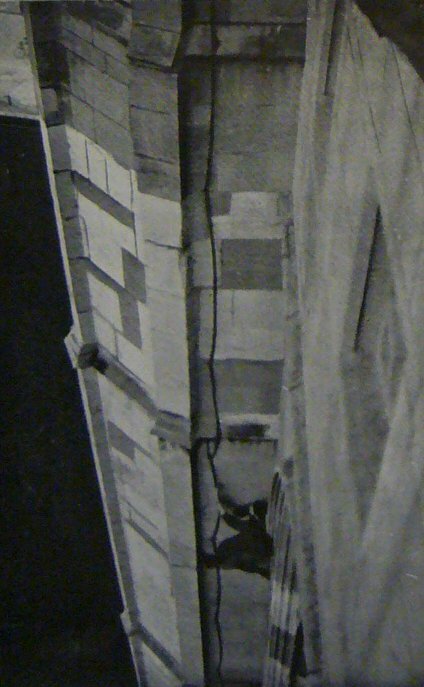 This is the chimney on the north-east turret, at the end of the north wall, as distinguished from the chimney on the other side of the turret, in K.P. It is in college, the revolving spikes over the railings being only a few feet away. None save the moon and the winking stars is likely to see you, though you might be detected from the windows of Clare. Immediately opposite is the Old Library, a building virtually uninhabited by night. There are some bushes about, and a wooden hut with a corrugated iron roof. A steel-pointed arrow, falling on to this roof from a dizzy height in the sky, once caused a serious fright to four chapel climbers. This is where you draw a deep breath and begin. If we are taking up some heavy or inconvenient impedimenta with us, it may be wise for one man to go up first with a ball of string in his pocket. He can then lower it, and haul up the luggage before No. 2 climbs up. Or, if there be an accomplice on the ground, we can both climb up together. It is not wise for more than two of us to climb at once. The top man may find the conductor pulled by the other two so close to the wall through the clamps that it is almost useless to him. Even with two of us this is inclined to happen. It is safer to go up singly. As you go into the corner, you find horizontal bands of stone which make it easy to ascend the first four feet. You find the conductor, running down the wall from clamp to clamp like a series of elongated D's (see photograph). It is just over an inch wide and about a fifth of an inch deep. It will probably make the palms of your hands slightly sore. Figure 15-1. Two-thirds of the way up. Figure 15-2. Chimney from below. Figure 15-3. Nearing the top. On this, the first pitch, the breadth of the chimney scarcely exceeds the length of a man's thigh. Only a Tom Thumb could hope to manouvre upwards without the conductor. A tall man must pull himself up almost entirely with his arms. Of the whole climb, this pitch of fifteen or twenty feet is the most severe opn the arms, and tends to tire them at the outset. Soon, however, there comes a broad, sloping ledge where you may sit and rest as long as you wish. Then the chimney proper begins. As may be seen from the photographs, it is of an ideal width for a climber. The is nothing to prevent him from mounting upwards at a rapid rate, and the conductor will prevent him from slipping sideways. It should be used for balance alone, as it is quite easy to climb with the legs. The stone flange against which the feet are pressed is about four inches wide, and as the side wall is at right angles to the side wall, the climber must be at a slightly oblique angle. It proceeds like this for about sixty feet and then, for the last ten feet, becomes a few inches wider. This chimney, although considered formidable on account of its length (the roof is ninety feet from the ground), is so straightforward that one is tempted to wonder whether it could be done without the lightning conductor. We mentioned the case of the don who is supposed to have got up without using it, but having it close at hand must have been a great comfort. A don in Trinity tells us that he got half-way without using it, hut had to lay a hand on it coming down. We have called the chimney severe, but this is more owing to its psychological effect than to any technical difficulty. Anyone who has once done it would do it again, rain or fine, tired or fresh, drunk or sober, and think nothing of it. A really severe climb, however often one does it, still commands the respect of the climber. Of course, the twenty feet up to the first ledge would be unclimbable, but there are loose ladders about in the college which should overcome the first pitch. Professor Pigou, whom we have already referred to in the last chapter, is also sometimes quoted as saying: "With the conductor, any fool could climb up to the roof. Without it, only a fool would do so." We agree with him. All climbers who have climbed the chimney and to whom we have spoken think that without the conductor it would still be possible. It is possible, but it requires intense concentration. The body has an unpleasant tendency to slip away to the left, and the more obliqne it is, the harder it is to get back, Without the conductor, the climber must go very slowly, and maintain complete control over body and mind during every fraction of a second of the climb. 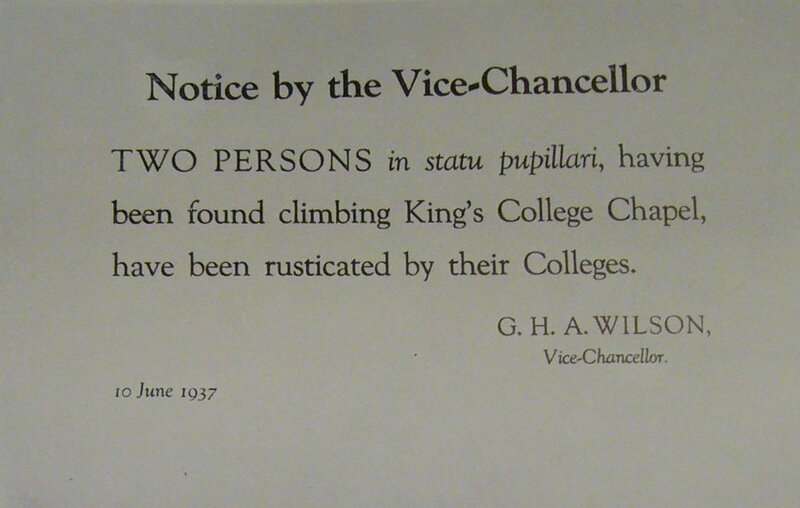 During the two years that it was without a conductor, the chimney was not climbed, but this was probably becaase the vast majority of undergraduates did not know it was possible. 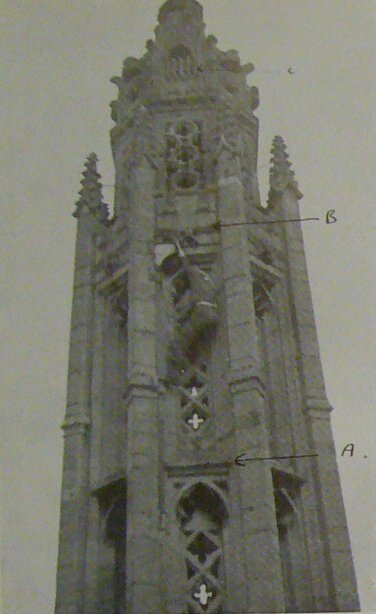 If ever the authorities remove the conductor again, we are confident that the chapel will nevertheless be climbed. Figure 15-4. 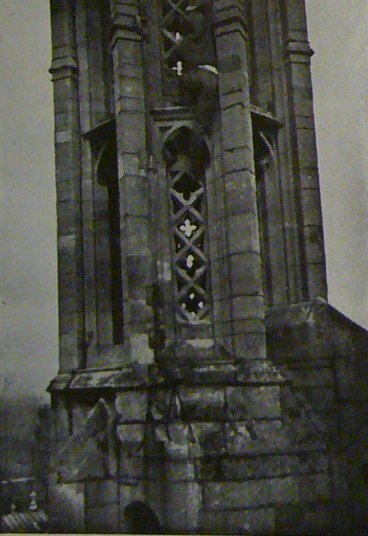 King's Chapel, North-east Pinnacle. Negotiating the first overhang. Note bare feet. The climber's back is dirty, having just come up the main chimney from the ground. A, first overhang, with clover leaf above and below. B, second overhang, with parapet just above. C, chess-board, at which point the stone becomes crumbly. With three simultaneous grips for the rest of the way up, the climb is safe. Figure 15-6. First overhang again. But having got up, the climber must get down again. 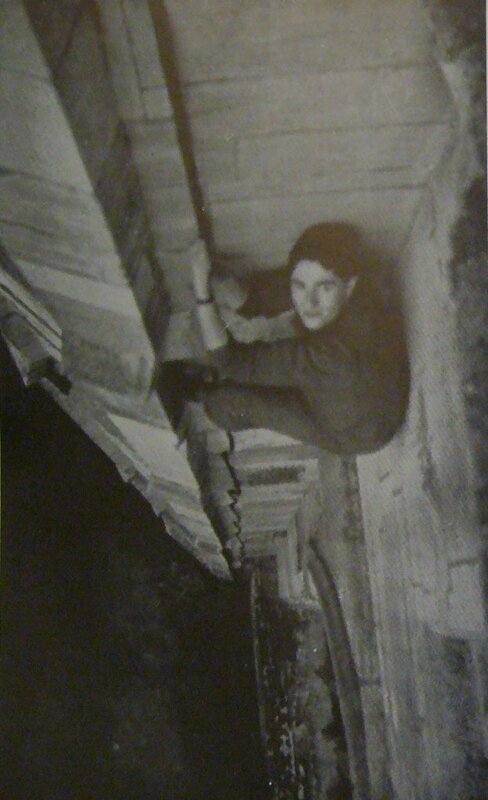 Without a rope or conductor this would be very severe, for descending a chimney is considerably harder than ascending. At the best, he would be taking a heavy risk, and no climber should do this. It would be possible to climb without the conductor and yet take no risks, but not to descend. So there must be a rope. This is where we remember the butterfly collector of 1934. The rope must be hanging from directly above the chimney. And we don't want to provide the authorities with another bell-rope. So get two hundred-foot ropes, and tie them together. Now pass the rope over the parapet above the chimney, with one length in the chimney. Pass the other end round the turret to an accomplice on the grass by King's Parade. The friction will be such that he can hold it easily with one hand, and the party can descend in safety. For such a climb without the conductor, the climber must be a tall man, as a short-legged climber might find the last ten feet somewhat too broad. But at the moment of writing the conductor makes it easy. We are now on the roof, and from here the turrets do not look very formidable. Mounting on the stone balustrade of the roof, we can step on to the sloping slab of stone a few feet up the turret. In front of us are air-holes for the bottom turret, each hole shaped rather like a clover-leaf. The holes are about fifteen inches deep and across, and are situated one above the other in a single row. The turret is octagonal, and on each side of us is an ornamental corner pillar. We call them ornamental because they support no weight, but they are quite smooth. No fancy flower designs festoon them. The pillars are about four feet to four feet six inches apart. 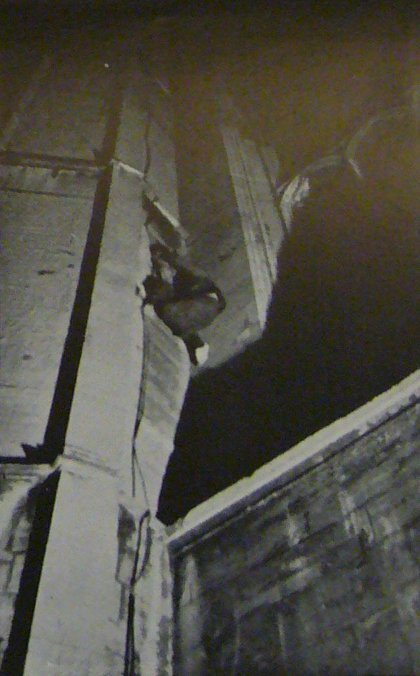 The climber may be tempted to chimney between them, but finds it is just impossible. To begin with, however, he can use the clover-leaf air-holes as a ladder. There is wire behind them to keep out the pigeons, but with care you can get your fingers through the wire. After a few feet you come to the first overhang. The pillars stand out vertically, away from the face. The overhang consists of a V-shaped projection reaching out as far as the pillar, and then sloping back again. For five feet there is no hand-hold. The tip of the V, it is true, is flat for about nine inches, but it is then rounded, and so is useless save as a pressure-hold, pressing downwards. It is best to ignore this ledge until you can get a knee or foot on to it. With the overhang above you, hold the clover-leaf with your left hand. Pass your right arm affectionately round the pillar. The square angle on the far side provides a friction finger-grip which prevents you from falling outwards. Double one foot under you in the chimneying position. You now find that the inner side of the pillar, being square cut, faces the clover-leaf up which you have been climbing. You can now chimney and wriggle upwards. Above the clover-leaf hole is an ornamental hollow, useless as a hand-hold but excellent for the feet. You get a foot into this, and are thus standing above the last hand-hold. The middle of the overhang should now be level with your waist. By leaning forward (still keeping your right arm round the pillar) you can reach the clover-leaf above the overhang. In your hurry don't get your little finger pinched between the wire and the stone, and don't hold the wire alone. Get your fingers through it on to the stone, so that you need not depend upon the security of the wire. You can now get a knee on to the ledge of the overhang, and your first difficulty is over. There next comes ten feet of clover-leaf ladder, and you are up against the second overhang. If you are a purist, you will find it more difficult than the first, though the principle is the same. But most climbers probably choose the face where there is a drain-pipe. This pipe is of no help on any of the turrets, except at the top. Very conveniently, it ends three feet from the parapet, half-way up the overhang. It ends in an open bowl, and is firmly clamped to the wall. You can grasp this bowl without chimneying. It is a foot or eighteen inches behind you. Leaning boldly outwards and grasping the bowl with both hands, you can walk up the clover-leaf with your feet up to the topmost hole. With your head level with the drain-pipe bowl you can grasp the battlemented parapet, and in a moment you are up, using the bowl as your last foot-hold. The stone-work of the parapet is perfectly firm. You are now on the parapet, forty feet above roof-level. Here we will leave you for a moment, and go down again to roof-level. In the last chapter we said there were two alternative methods of surmounting the overhangs (or with the drain-pipe, three for the second). The second method is more obvious and easier, but requires a steady head. We get on to the slabs, ten feet above roof-level. Standing very upright, we pass an arm round the pillar. The other hand holds the near-side edge of the pillar. As the two inside edges point inwards, they provide ample friction-hold against falling outwards. We now pass our body very gingerly round the pillar. Then upwards and forwards, up to the clover-leaf. Then round the next pillar, and so on until we reach the lightning-conductor, by whose help we can easily surmount the overhangs and rejoin you on the parapet. So next time, you can take your choice. If you go round to the conductor, you will make one of the most sensational traverses in climbing. As you pass round each pillar, the whole of your body except your hands and feet are over black emptiness. Your feet are on slabs of stone sloping downwards and outwards at an angle of about thirty-five degrees to the horizontal, your fingers and elbows making the most of a friction-hold against a vertical pillar, and the ground is precisely one hundred feet directly below you. If you slip, you will still have three seconds to live. However, if it has not rained for twelve hours, this hyper-sensational traverse is not difficult. As you step onto the parapet, a flurry of pigeons may disturb you. Numbers of them sleep inside the parapet. You even may, as has been done before, put your foot actually on to a bird, The surprise will be mutual, but don't step back and raise your hands in Victorian fashion. And be assured, though the flapping of the birds is tremendous, no one on the ground seems to notice it. The turret has now become somewhat smaller in girth. There is more clover-leaf for about eight feet, but this time it is free of wire mesh, so that you can put your hands through and obtain really good holds. At the top of this comes your last difficulty, requiring careful rather than unduly skilled climbing. The clover-leaf stops, and a four-inch ledge is about two feet above it. This is not very satisfactory, as there is no finger-grip, and one must counter the tendency to fall outwards. However, looking down, you will see the corner pillar projecting about five feet above the parapet, tapering up to a point about as big as your fist. You can stand on this with one foot, and by putting most of your weight upon it, will evade the outward tendency. This one small foot-hold, appearing in space out of the darkness, has something weird about it. It gives you a peculiar sensation, and you feel like an ant balancing on a needle. The projection of the pillar is quite safe, as it is secured to the turret by an iron bar. Now, to negotiate the next few feet. On the left, at arm's length, is an ornamentation known as the chess-board. In size and shape it is akin to a square block of electric-light bulbs. On no account use this. The bulb-shaped projections of the stone form tempting hand-holds, and are probably safe. But they are not very big, and should one break off you will not be able to recover yourself. On the right, at about the same level, is the first gargoyle,  sticking out horizontally for fifteen or eighteen inches. You will have to use it and at one moment to put a considerable amount of weight upon it. This, if you have read the previous chapter, is where you will remember the story about the sliver of stone which came off the upper surface of a gargoyle. You put your hand upon it, and the moment is fraught with care. 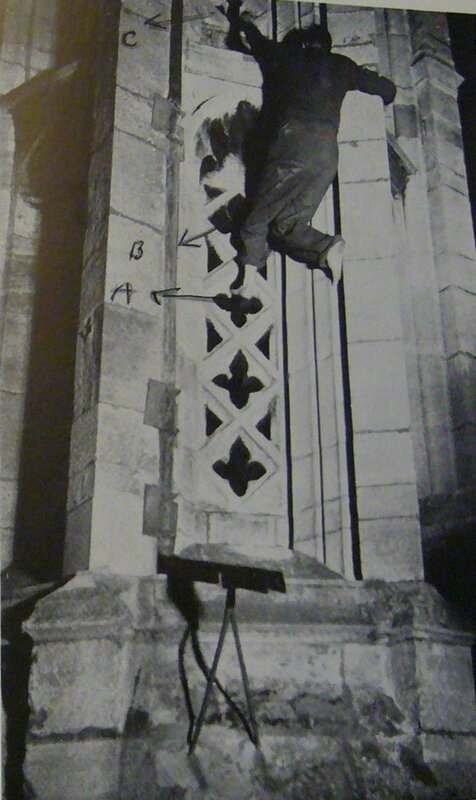 The gargoyle is slightly thicker than a man's thigh, and you can get no finger-grip. To avoid all danger, press downwards upon it, rather thae downwards ond sideways. The surface cannot then crumble off. You may perhaps find it convenient to get both hands round it, with the fingers locked. 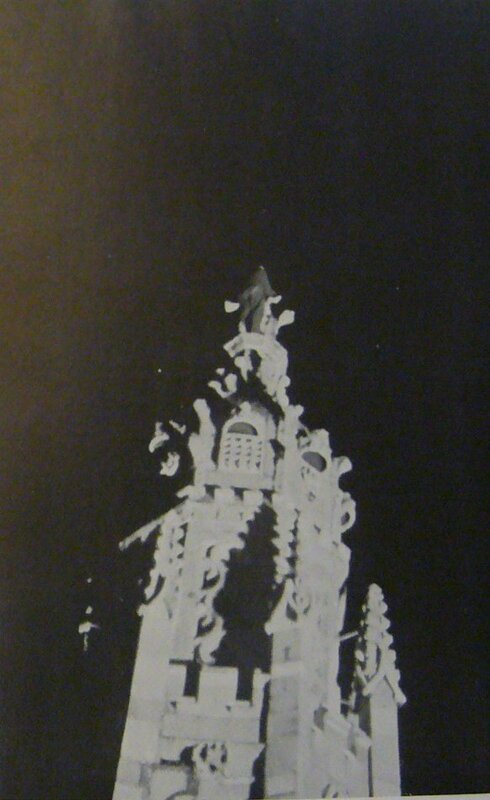 You will then be able to walk up to the top clover-leaf, and reach out to the gargoyle on the left. Figure 15-7. The last thirty feet. From now on the climb is easy. You are entering upon the bottle-neck, which is at about seventy to seventy-five degrees to the horizontal, but after the unrelieved vertical ascent feels like crawling on one's belly over flat ground. Numerous gargoyles seem to appear everywhere, like the arms of an old yew tree. In a few moments we are at the top. Standing on two of the three spacious pseudo-gargoyles four feet from the top, you can clasp your hands round the stone, the top of which is level with your chest. The lightning-conductor, a friendly and inflexible steel rod as thick as your finger (very different from that in the chimney), sticks up for another three feet. The top has a circlet of three firm spikes, so that if you wish you can stand on the tippety top of the stone, We do not advise this, as in such airy places the wind is fitful and uncertain, and a gust may came out of a calm night. What do you feel as you are standing at the top? Triumph? Awe? A sense of great height? Fear? Anxiety about the descent? Perhaps the first feeling is one of disappointment. The ambition of which you have been dreaming for weeks, or even months, is finished, and you must find another to replace it. You have been dreaming, glorying in the thought of it, and now in a few drab moments after the thrill of endeavour you are in the throes of success. You are standing on the peak of what is held to be a considerable achievement. Climbers may think that unknown heroes have been at work, and only you know yourself for what you are, a very naked body behind it all. You feel a usurper, a filcher of honours which the truly brave would scorn to earn. The height does not inspire you. You simply feel a very insignificant man standing on a monu- ment of insignificance. But the exaltation will come later. When all is over, you will enjoy facing your bed-maker's cross-examination, replying to her queries by a bland look of innocence and a rather fatuous grin. You will bounce about with tremendous satisfaction, and feel more pleasure in living than you have ever known. The exaltation resulting from a difficult climb lasts for about three days, and during that time you will feel the devil of a fellow. At the moment of writing the last three chapel climbers have been Old Rugbeians. We call them gargoyles, because that is what they most resemble. Strictly speaking, however, they are not gargoyles but plain blocks of stone.